Spring is winding down and we’re now heading into fall. Our bodies are starting to adjust to the subtle changes in temperature and so our homes will have to as well. What you pay for your energy bill will vary greatly depending on the size of your home, your city, and your state. Regardless of those factors, there are a few steps you can take to make your home a lot more energy efficient. For starters, make sure that any heating or cooling equipment that you’re buying is Energy Star Certified and that it meets the minimum ratings according to the Energy.gov efficiency standards. With your air conditioners, make sure that your filter is cleaned or replaced as recommended. The more clogged the filter is, the less efficient your unit will be. As a rule of thumb, keep your thermostat as warm as you can get it while still being comfortable. When you’re asleep or away, set it to go even higher. You can do this manually, but making use of an automatic thermostat will greatly simplify things. With some contemporary thermostats, you can even make adjustments from your phone! When it comes to heating, you can’t afford not to look into more energy efficient tips. According to Engergy.gov, roughly 42% of your utility bill will go to keeping your house warm. You can apply a lot of the same steps of air conditioning to heating, but there are several special things to keep in mind. Make sure your insulation is up to snuff. A lot of warm air escapes, due to poor insulation. Likewise, make sure your air ducts are properly sealed. Although portable heaters can easily be less efficient than central heating, they can pay for themselves if you’re just trying to warm one room. Lighting typically makes up 25% of a home energy budget. With traditional incandescent light bulb, 90% of the energy used is give off as heat. That means that all of that light you’re seeing is only a tenth of the energy actually needed. By far one of the simplest (and most affordable) ways to cut back on energy bills in your home is to get rid of those incandescent bulbs and go for a halogen incandescent, a compact fluorescent lamp (CFL), or a light-emitting diode (LED). Each of these vary in the light that they output and within each category you will find different categories of light. For additional energy savings, install a dimmer to make sure that you’re not using any more light than you need to. Installing your own solar arrays is a sure-fire way to lower your energy costs and your carbon footprint. 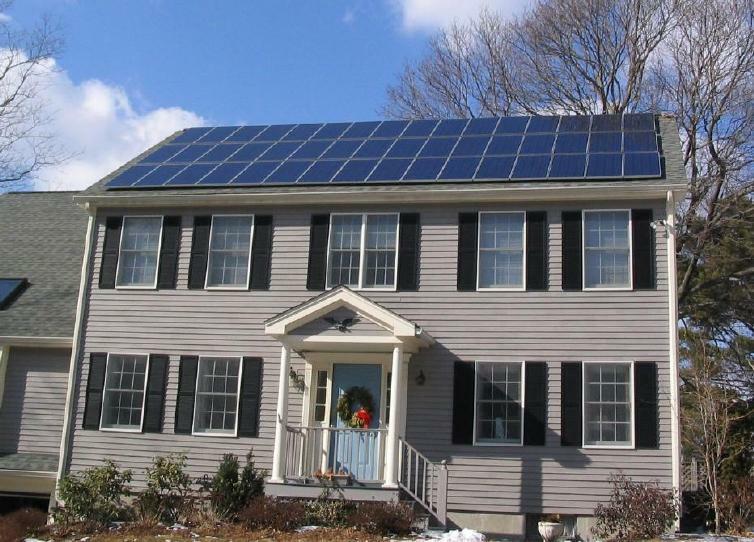 Most home solar electrical system arrays can be easily outfitted on residential roofs. Depending on where you live you may want to opt for grid-connected or off-grid systems. Some electricity companies will allow you to “sell”your excess energy to the larger grid through a system called net metering and some states may even pay you to install solar systems. These are just a few tips to help save money and reduce your carbon footprint. For more tips, consult Energy.gov or take a look at your states energy website. Like with solar, you may be eligible for tax break or other incentives for switching to more energy efficient layouts.